The Sinclair DNA study has 12 distinct lineages. Some of these lineages have many different surnames in their DNA matches. Others will find that they have almost none outside of our family. 2. The R1b haplogroup were successful breeders since the last Ice Age. But this theory became suspect when some of our R1B members had almost zero name matches, and others had nearly 1000. The question of why some people have so many name matches has never really been resolved by Family Tree DNA, or other groups on the Internet. And then there's the question of the surnames among the name matches. Today I'm going to propose a new theory, based on research underway in the Sinclair DNA study. Some of our Sinclair DNA name matches show nearly 1000 different surnames. Setting aside the standard reasons that this might be the case, what other reasons might account for having so many name matches? I offer the theory that perhaps we have an ancient ancestor who was very active, siring many children. 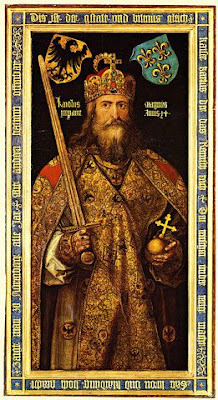 The candidate that comes to mind is Charlemagne. Derek Wilson's biography "Charlemagne" indicated that the man had 20 children, some legitimate and some illegitimate. Sir Francis Palgrave indicated that Charlemagne had seven sons who reached maturity. History.com suggests that Charlemagne had up to 18 children. Those would be the documented and prove-able ones. Beryl Platts, a researcher whom I quote often in the Sinclair DNA study, has suggested that many of the Flemish of Scotland are direct mail descendants of Charlemagne. If you study the counts of Boulogne, you will see that they have descendants who have surnames like Graham, Lindsey, Oliphant, Seaton, Stewart, Montgomerie, Hay, Umfraville, Douglas, Crawfurd, etc. These are the surnames Platts focused on in her research of the heraldry of Flanders. These are also surnames that show up in many of the Sinclair DNA study's L21 SNP participants' name matches. Charlemange (Charles the Great) was born about 742 AD and died in January 814. He was the son of Pepin "the Short" and the grandson of Charles Martel, famous for winning the Battle of Poitiers against the Umayyad Caliphate. No one can yet prove the DNA of such people. The current TMRCA calculations for L21 would counter your argument but hey what do they use to make those calculations? Maybe you are right. Totally agree L21 is too old for that. I was thinking more of the SNPs downstream of L21. Probably a specific one that isn't even identified yet. I suspect L193 will eventually be found to be too recent to represent Charlemagne's time period. Do we have a MRCA for L513? Sorry for the delay responding Scott. TMRCA for L513 is currently estimated at 1500 years ago.